There are plenty of chests scattered around the Fortnite Salty Springs area on the Battle Royale map, but you’ll need to track down seven of them in total if you want to complete this Fortnite Week 10 Challenge. In this Fortnite Salty Springs chests guide, we’ll be detailing how you can easily uncover seven chests in the relatively small area, revealing the full list of Salty Spring chest locations in the process. But with this seasonal event of Battle Royale almost done, it’s time to start looking ahead to the next event for the game. For a complete walkthrough of everything we know about the next Battle Royale season so far, head over to our Fortnite Season 6 guide. These Fortnite Week 10 Challenges are live right now in Battle Royale, having launched around 6 am PT/9 am ET. If you want a walkthrough of all the challenges that are available right now in Fortnite, you’ll want to head over to our Fortnite Week 10 Challenges guide. As for this challenge, you’re going to have to find and search seven chests in total in Salty Springs, to complete the single challenge as part of Week 10. 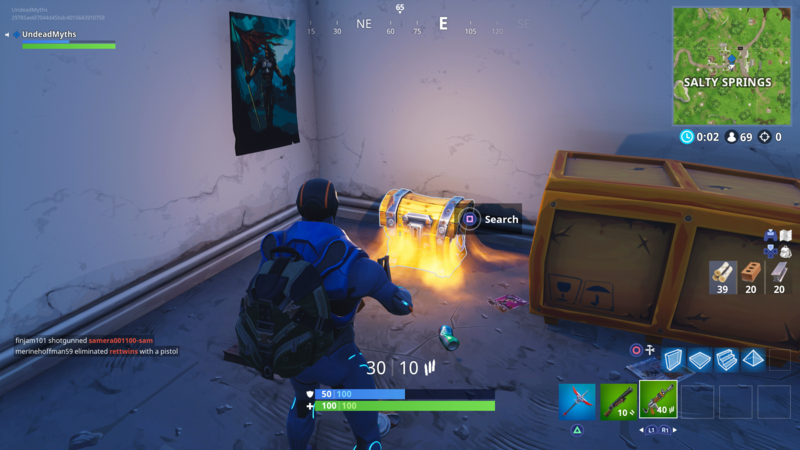 Just below, you can find a list of every single chest in Salty Springs that we’ve managed to uncover so far. 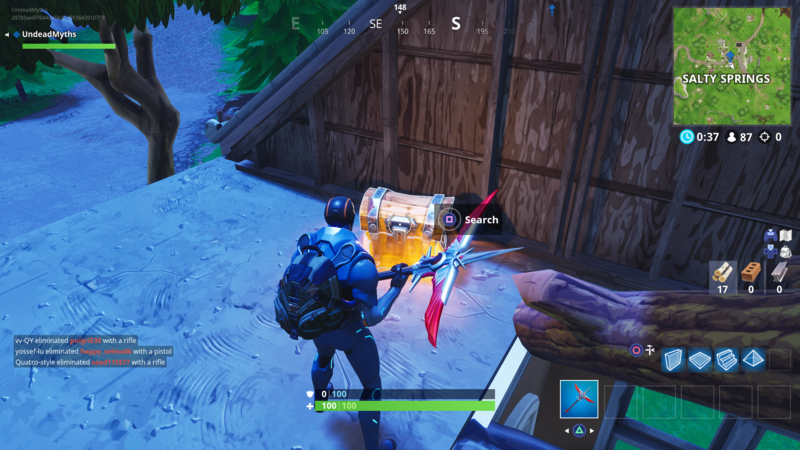 You’ll bag yourself some nice loot from searching these chests, so it’s easily possible to visit multiple chests in a single match while staying alive in Salty Springs. There’s a large house in the western portion of the Salty Springs map, which contains four possible chest spawns. 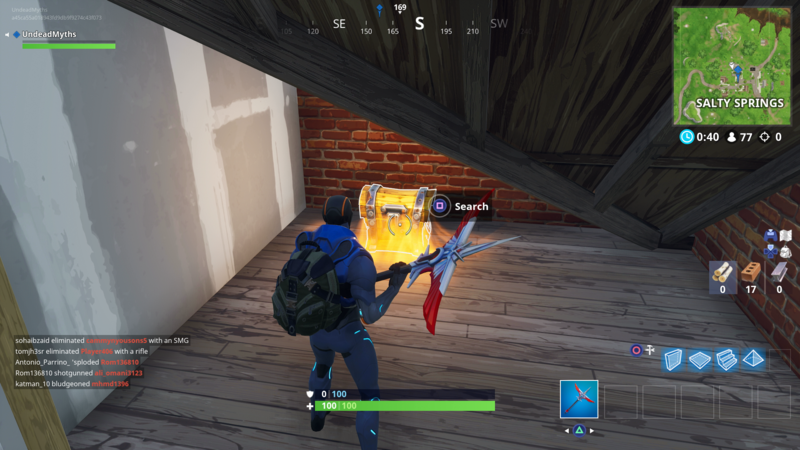 The first chest spawn is up in the attic of the large house, which you can break into with a pickaxe. Enter at the ground floor and take the stairs down, and you’ll find another possible chest spawn in the bathroom. Underneath the stairs that you just used from the ground floor, there are some boxes blocking a hole. 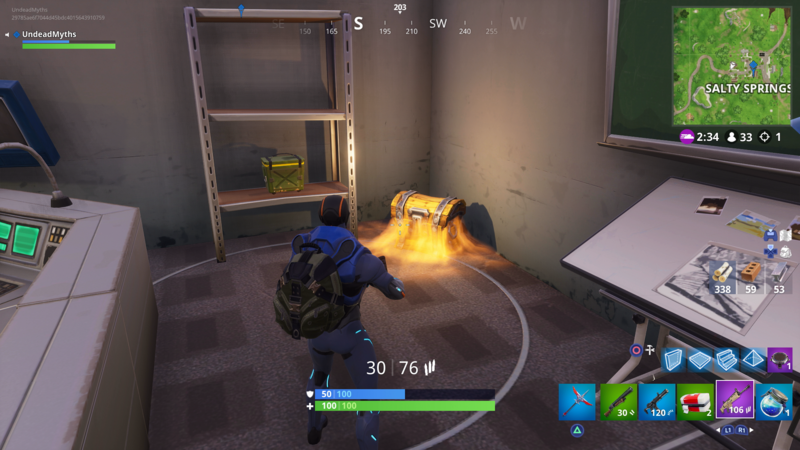 Break through the boxes and the hole, and you can find another chest in the secret bunker. 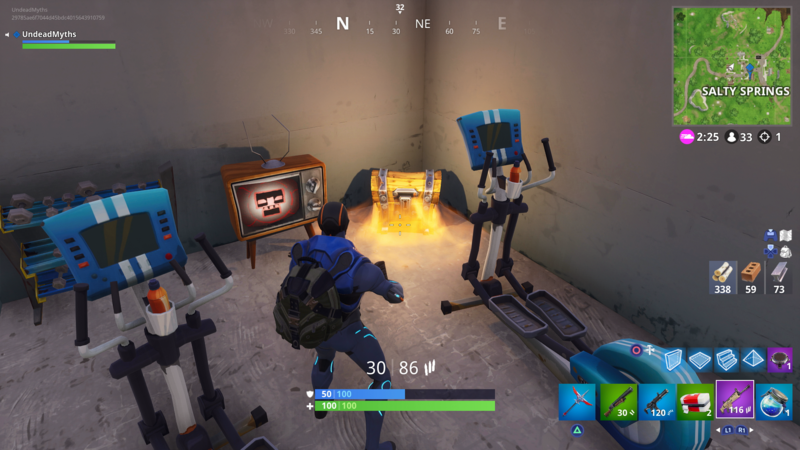 In the very same room as the last chest, on the opposite side of the room to the treadmill, you can find another chest next to the ammo box. There’s a ruined house in the south-central area of Salty Springs, which contains three possible chest spawn locations. If you land on the roof of the house from jumping out of the Battle Pass, you can break your way through the roof to find a chest. 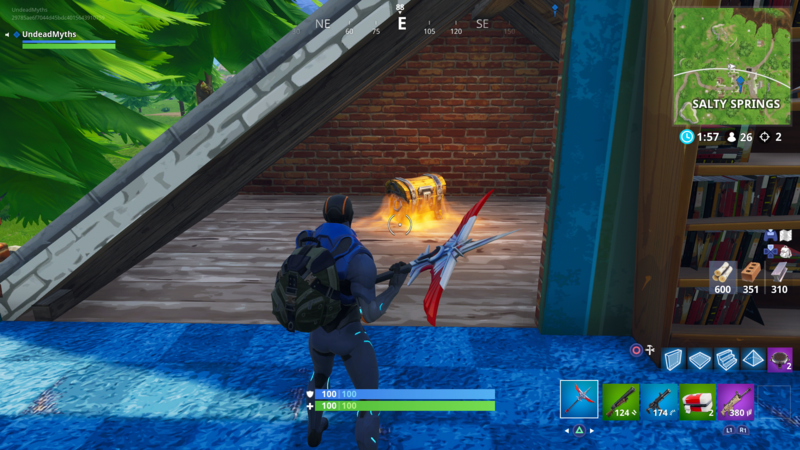 There’s a chance for a second chest spawn in this same location, on the floor just below the one you break into from the roof. Enter through the ground floor, and take the staircase down. Turn right, and you can find another chest just next to a large wooden box on the ground. Head to the house in the eastern portion of Salty Springs, and you can once again break through the roof to uncover a chest on the very top floor. On the southwestern side of this same house, there’s a chance you can find a chest in the bedroom area on the first floor. If you land on the large house in the northern part of Salty Springs, you can find a chest on the very top floor just below the roof. On the floor just below the attic in the northern house, you can find a chest on the northeastern side of the building. 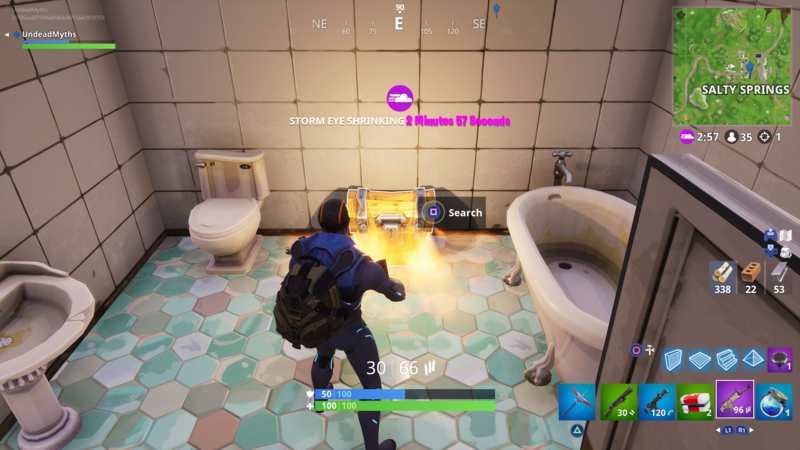 Head to the gas station just northeast of Salty Springs, and there’s a chance you can find a chest on the ground floor of the building. 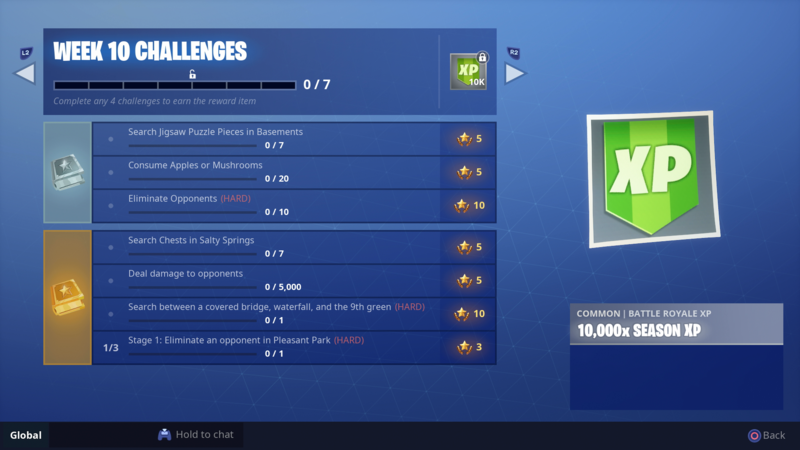 Keep in mind that to complete this Fortnite Week 10 Challenge, you don’t have to find and search all seven chests in a single match. 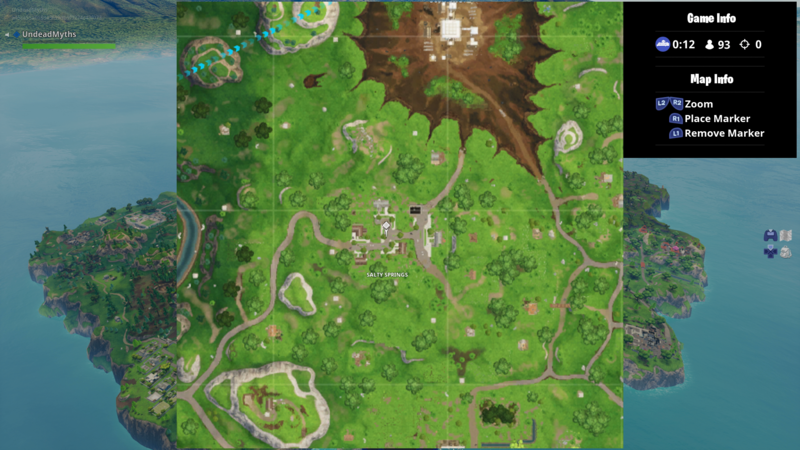 Seasoned Fortnite players will know that you only need to find and search seven chests in total in Salty Springs, and this can be spread out across as many games as necessary, not just a single match. Make sure to head back to our Fortnite Week 10 Challenges guide once you’re all wrapped up with this particular challenge. We’ll be continually updating the page throughout the day that the challenges go live on, to bring you all the latest hints and tips for completing all six additional challenges.